After eight games of the 2018 campaign, the sample size is too small to detect any big-picture trends. No, the Chicago Cubs are not atop the National League Central. With a 4-4 (.500) record, the Cubs are tied for third-place with the St. Louis Cardinals and they trail the Pittsburgh Pirates by two games. So far, the Cubs have only faced three opponents. They split the first four-game series on the road against the Miami Marlins, then the Cubs traveled to Cincinnati to face the Reds. The Cubs and Reds were only able to play one of the two games due to inclement weather. The Cubs fell short and were shutout during the lone game played. Today, the Cubs look to win their third game of the four-game set against the second-place Milwaukee Brewers before traveling home and opening Wrigley Field for the year. But after eight games, a few patterns have emerged. 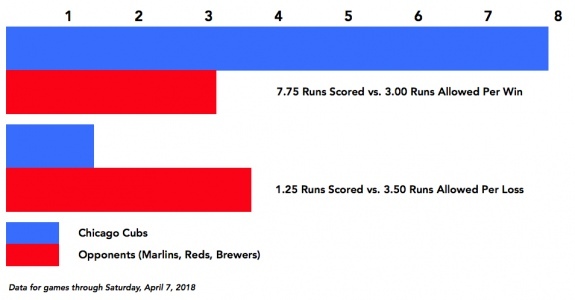 When the Cubs win, they score big numbers to the tune of 7.75 runs per win. During the team's four wins, they have only allowed 3.00 runs on average. That's a nearly five-run differential. Conversely, they only plate an average of 1.25 runs per loss. In losses they cede 3.50 runs to their opponents. My first game of the season was not scheduled until later in April. And that wasn't even a Cubs game. I was supposed to see the Houston Astros, the defending World Series champions, battle the up-and-coming Chicago White Sox. But an opportunity to see the Cubs play the Brewers at Milwaukee's Miller Park presented itself. 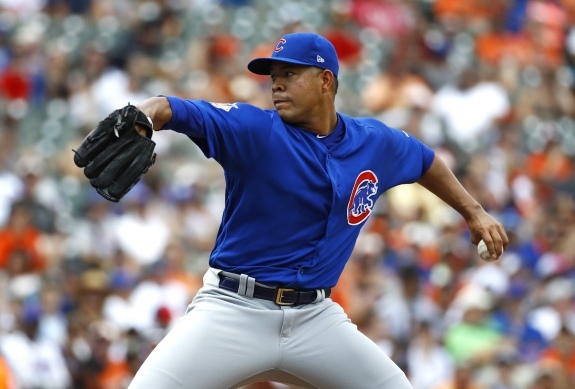 Today, left-hander Jose Quintana (0-1, 9.00 ERA) takes the mound for the second time this season. This is the first time I've seen him pitch since he was traded to the Cubs from the Chicago White Sox last season. Milwaukee will answer with right-hander Chase Anderson (0-0, 3.60 ERA). Like Quintana, Anderson is also making his second start of the season. On the injury front for the Cubs, first baseman Anthony Rizzo has missed a few games due to a stiff back. The Brewers' major offseason acquisition, Christian Yelich, has missed the last few games due to an oblique issue.